The IRS says there is no free lunch when it comes to taxes. If you transfer title on your home, whether voluntarily through a warranty deed or grant deed, or involuntarily through foreclosure, you have sold your home. You might be subject to taxes, even if you sold your home at a loss, either on a short sale or by foreclosure. It doesn't seem fair. What's worse is you might not even find out that you owe taxes until the day you open your mail to find a 1099. Bear in mind not all 1099s mean you will pay income tax, either. The banks send 1099s as a routine matter. "Sellers who have owned their personal residences for lengthy periods still will realize gains. "But sellers of residences acquired within the past two years or so are going to incur losses. Even assuming no price declines, losses will result because of expenses for real estate brokers, lawyers and the like. Sellers will not be able to deduct those losses. Makes no difference that they are forced to sell because of, for instance, job changes or health reasons. "Besides problems for sellers of personal residences, there are tax troubles for investors who, say, bought several condos in places like Florida and are unable to flip them because prospective buyers are waiting for further price declines. Often, it is not worthwhile for those investors to rent their places; what they receive as rent payments will be insufficient to cover their real estate taxes and mortgage interest. Their only option is to sell at a loss." "Sellers can offset their capital losses against capital gains. But in the absence of capital gains, the yearly cap is $3,000 ($1,500 for married couples filing separately) on the amount of losses they can offset against their "ordinary income," meaning income from sources like salaries, pensions, and withdrawals from retirement plans. The law allows them to carry forward unused losses to later years." "The IRS has tax rules for foreclosures or repossessions by lenders of homes of owners who have fallen behind on their mortgage payments. There can be severe and unexpected tax consequences for an owner who simply walks away because he or she has little or no equity and the lender takes over and sells the place. "In that situation, cancellation or forgiveness by the lender of the debt usually means the debtor has reportable income, though there are some exceptions—for instance, insolvency." "An example: Brown buys a condo and uses it as a personal residence. He pays $300,000, down payment of $15,000, and takes a mortgage loan of $285,000. He is personally liable for the mortgage. When the remaining balance of the loan is $280,000, Brown defaults and the lender bank accepts his voluntary conveyance of the unit, canceling the loan. Similar condos at the time sell for $230,000. "The tax code treats the transaction as a sale. Brown incurs a nondeductible loss of $70,000, the amount by which his condo's adjusted basis of $300,000 exceeds its market value of $230,000. No deduction for the loss because Brown uses the condo as a personal residence. "Brown also has reportable income of $50,000 when the bank cancels the loan. The $50,000 is the amount by which the debt of $280,000 exceeds market value of $230,000. "Enter the IRS when the mortgaged property is foreclosed or repossessed, and the bank reacquires it, or the bank knows Brown has abandoned the property. The bank sends a Form 1099-A to Brown and the IRS. Using the numbers in the example, the 1099-A indicates the foreclosure bid price ($230,000), the amount of Brown's debt ($280,000), and whether he was personally liable. Debt cancellation (here, $50,000) is taxed at the rates for ordinary income, same as for salary." 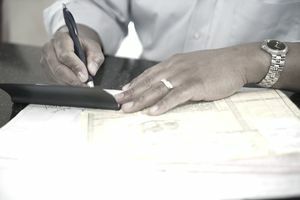 According to Kleinrock Publishing, the IRS says sellers who are not personally liable for a debt will realize an amount that includes the full canceled debt, even if the value of the property that is security for the debt is less, which can be offset depending on your adjusted basis in the property. Purchase money loans secured by real property in California carry no personal liability. For example, Ms. Smith buys a home valued at $300,000, puts down $30,000, and takes out a mortgage of $270,000. Smith stops making payments. The bank forecloses on a loan balance of $260,000, and the market value of the home has fallen to $250,000. Smith has an adjusted basis of $295,000 due to a $5,000 casualty loss. The amount Smith realizes on the foreclosure is $260,000. Smith figures her gain or loss by comparing $260,000, which is the amount realized, to her adjusted basis of $295,000. She has a $35,000 realized loss. Before you sell on a short sale or go through a foreclosure, seek legal and tax advice. Do tax planning ahead of time, before it is too late. For more information, contact a certified public accountant or check the IRS web site. A temporary fix, called the Mortgage Forgiveness Debt Relief Act of 2007, provides relief from debt forgiveness taxation for certain owner occupants and might expire prior to renewals. California laws are different for short sale taxation due to CA Civil Code 580e and mortgage letters issued by the IRS and on behalf of the Franchise Tax Board. Seek out competent tax advisers to determine if you are exempt from taxation. Source: Attorney Julian Block's books include "The Home Seller's Guide to Tax Savings," praised by law professor James Edward Maule of Villanova University as "An easy-to-read and well-organized explanation of the tax rules.” To order his books, visit Julian Block's Web site.